It’s not a race – That’s what they told us anyway. 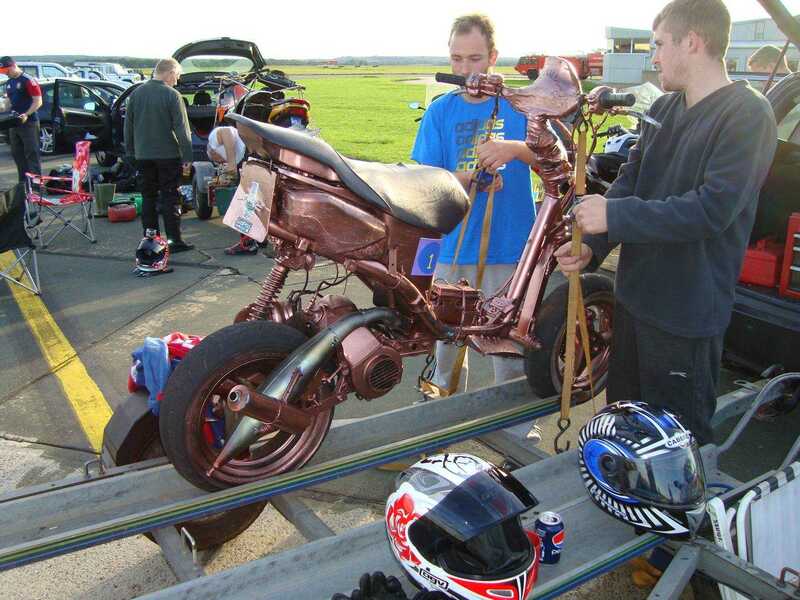 No timing or lap scoring, just a 6 hours endurance race, sorry, event on mopeds. 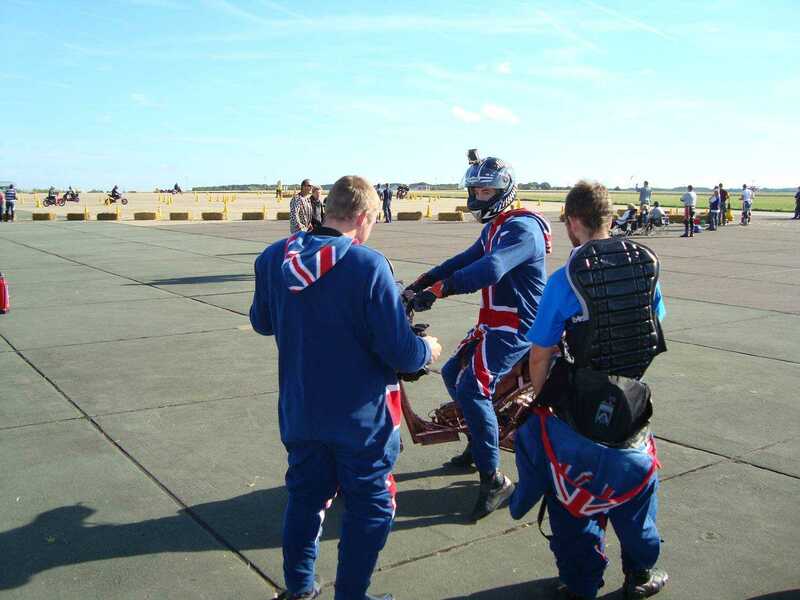 Ways to make life on an aerodrome interesting at the weekend? Well come on, when you get a few dozen daft sods together on a bit of tarmac with stripped down peds and tell them it’s not a race you don’t seriously expect them to believe that do you. It’s a race. It’s always a race. Life is a race. 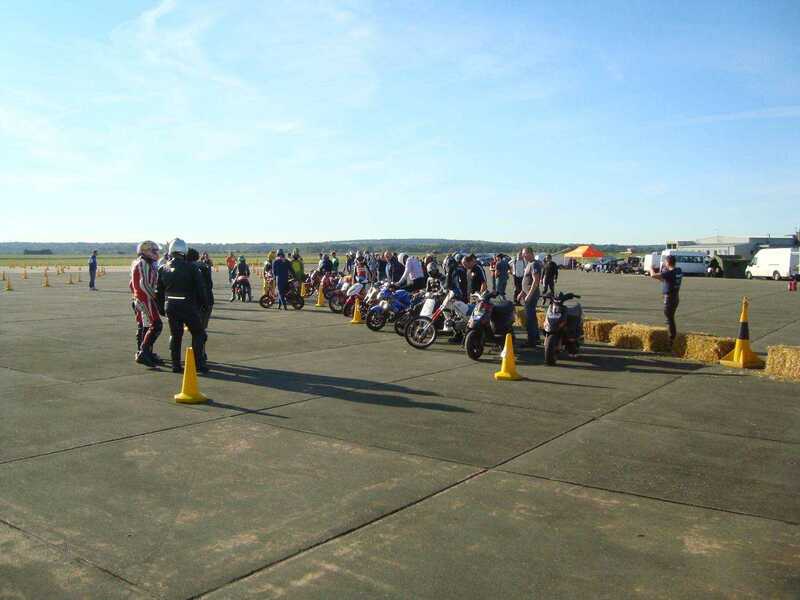 The official title is Mopedathon though, and the RAF have been organising this for several years, most recently at Odiham near Basingstoke. 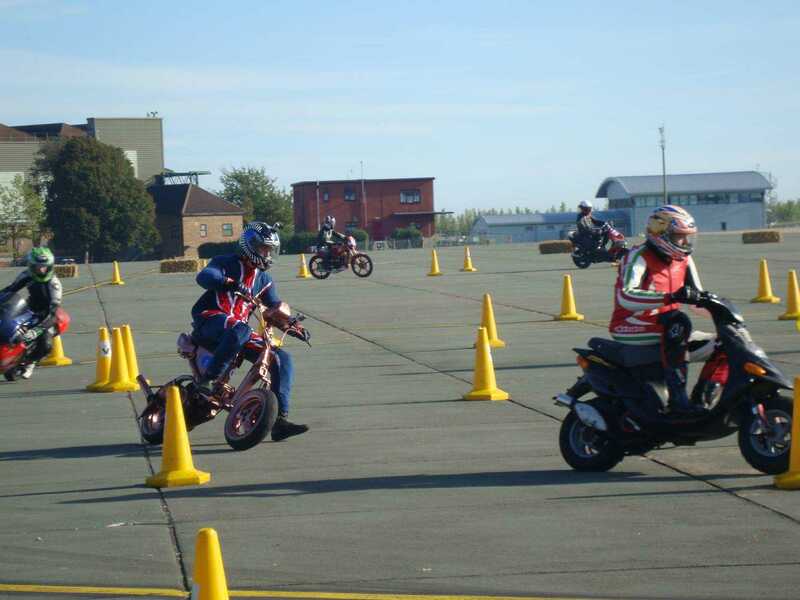 The RAF station has its own bike club (with so much spare tarmac it would be rude not to) and they organise the Mopedathon which is open to anyone willing to pay £100 to the RAF Benevolent Fund and turn up with a suitable pile… erm, bike. Regs are simple. Bikes must have originally been road legal, so no pit bikes or minimotos. Max capacity 50cc 2-strokes or 90cc 4-stroke. They must have working brakes, a fuel tap and a means of killing the ignition. There must be a nominal attempt at silencing. 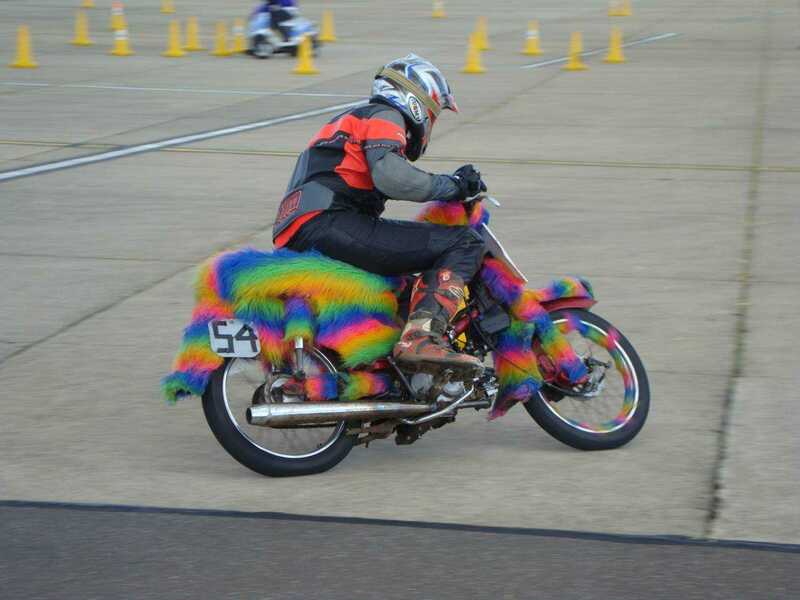 Leathers are recommended but not compulsory (remember, it’s not a race) and riders should have a full road licence to show they have some idea what they’re doing. So there we were, me, Jonny, Andrew and Stephen, shivering on a bit of windswept tarmac in Hampshire in October, waiting for the off. Andrew and Stephen had prepped the bike, formerly a Peugeot Speedfight. We’d done the event a couple of years before and it was the slowest thing out there – I was overtaken by a mobility scooter. Not just overtaken, I was beasted. That thing was a beast, with a 90cc engine grafted in that drifted round corners on two wheels. But nobody cheats, because it’s not a race. This year our own wee beastie had been tuned up with a big carb and a natty side exit exhaust so double digit speeds were a real possibility for a change. “It’s dead quick” they told me. They lied. But hell, it looked good. Everything, including the tyres, had been sprayed bronze with rattle cans. If we couldn’t be the fastest we would at least be the most stylish. After a riders’ briefing the bikes were lined up along the start straight, Le Mans style. The entire field probably accounted for less horsepower than one Le Mans bike but what did we care, we were high on the adrenaline rush you can only get from a race. Or a non race. It started to the blast of an air horn and all hell was let loose. Moto2 is nothing compared to trying to get 60 mopeds through a hairpin bend the width of a car. In deference to keeping all my limbs attached and pointing the right way I let my son Jonny take the first stint. 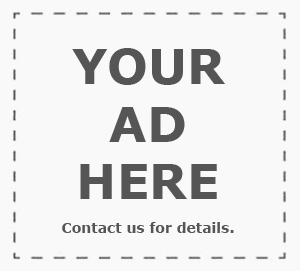 It was a strategic team management choice. He’s young, brave and indestructible with a history of locking bars in schoolboy motocross. A couple of laps in he was in the first few bikes but then the leaders caught the stragglers in the tight, cone-and-strawbale course and position counting became impossible in the melee. Twenty minutes in the first bikes started changing riders. We followed suit and I hopped on. It’s not an experience that will change my life but it’s one I will remember for a long time. The bike has all the gusto of an athletic sloth until the revs reach approximately one million and then it gathers its skirts and hurries along with the urgency of an annoyed nun. On the tight twisty course corners sneak up on you surprisingly fast, which is my excuse for overshooting most of them, though with practice you can nip round surprisingly well, the brakes hauling it down with leg dangling Rossi style and using other bikes as berms Marquez style. 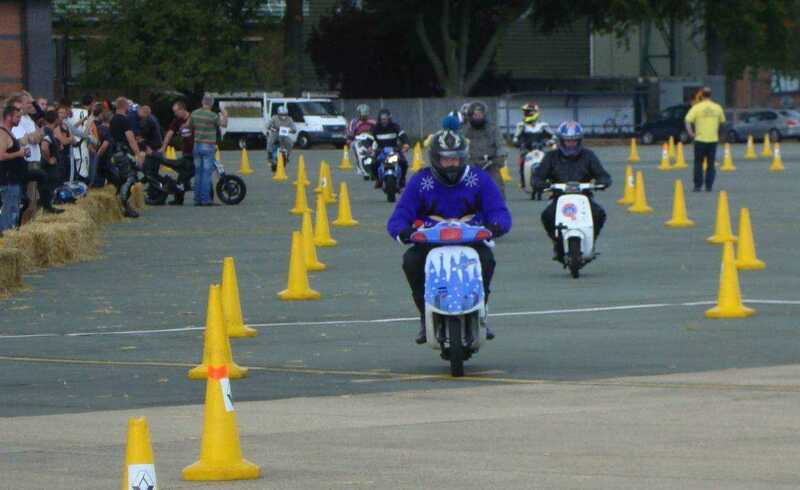 By the end of my stint other riders were exploring the limits of their tyres more than I was, a ‘50cc’ was popping big wheelies down the main straight and a ‘C90’ was lapping everybody with a surprising turn of speed. I was holding my own but the effort of the constant turning and braking meant I was ready for a break. Out went Andrew, another former motocrosser happily bouncing off all the other bikes as the competition generally got a bit more sporting. Three hours on, the notarace paused for lunch and the direction of the course reversed, with noticeably fewer riders as the mechanical demands of the morning took their toll. More space on the track meant more dicing and less barging, though my fellow team members who seemed to have forgotten that it wasn’t a race continued intent on leaving rattle can bronze marks on the other teams’ steeds. By the end roughly half the field was still running and we’d got through almost 15 litres of fuel. That’s about 30mpg from a moped and if it’s not an economy run then it must be a speed event. Now what do they call those? 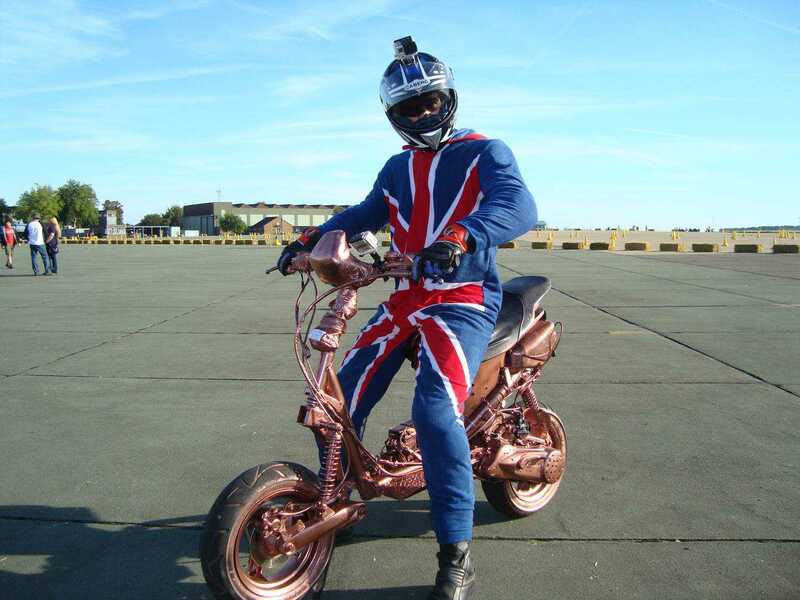 As a memorable occasion the Mopedathon takes some beating. 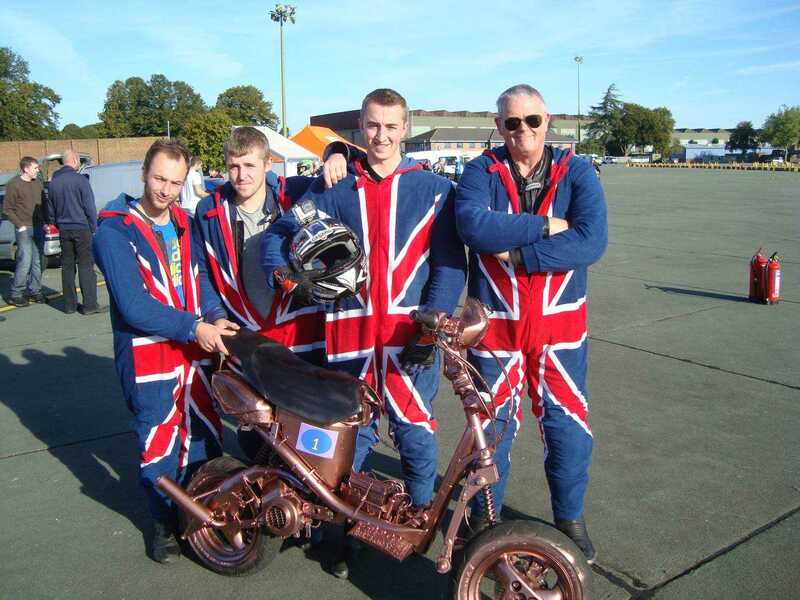 It’s the most fun you can have with leathers and team onesies on, the craic with the other teams is first class and the proceeds go to a great charity. And yeah, of course it’s a race. This looks like great fun ! and relatively safe haha!